The state’s bad bank generated €4.5 billion last year. NAMA’S CHAIRMAN FRANK Daly says that their work “will become increasingly visible”, some of it through “the sight of cranes returning to Dublin’s Docklands”. Daly made the remarks as the state’s bad bank published its 2013 annual report which showed a profit of €211 million for the year. The profit represents a 8 per cent fall on that which was achieved last year. Much of the decline is due to cash reserves set aside to deal with the fall in value of unrealised property assets. These costs, known as impairment charges, were €914 million last year, up from €518 million in 2012 with NAMA saying that the increase came following a “comprehensive review of impairment provisioning”. Daly said following the report’s publication that last year saw a “remarkable turnaround” in how investors viewed Ireland, something he says means that it is likely that NAMA will achieve its goals “sooner than anyone would have expected”. “We have a lot of work to do but this work will become increasingly visible – whether in the sight of cranes returning to Dublin’s Docklands or in renewed activity involving our assets throughout Ireland, ” he added. NAMA’s fourth annual report shows that they generated €4.5 billion last year from the sale of assets and from other sources like rental income. Since the bad bank became operational in 2009 it has produced €18.6 billion in cash, including €14.1 billion from asset disposals. €3.5 billion of this has been raised so far this year. NAMA chief executive Brendan McDonagh said that the cash raised has been in part because of “the very strong demand for the assets in our portfolio”. “We reported a profit for taxpayers for the third year in a row and successfully met our first major milestone of repaying €7.5 billion of NAMA’s debt in full and on time,” he said. Reacting to the publication of the annual report, Finance Minister Michael Noonan said that ”it’s quite clear now that NAMA is a very successful organisation” . He added that a strategic review of NAMA will be finalised and laid before the houses of the oireachtas before the summer recess. The strategic report of NAMA’s operations between 2010-2012 by the Comptroller and Auditor General is due to be discussed by the Dáil Public Accounts Committee on Thursday. Among the findings in the report was one which questioned how the sale of twenty-six properties was undertaken. The state’s public spending watchdog said it found ‘no evidence of open marketing’ in the sale of these properties. Email “NAMA promises "the sight of cranes returning to Dublin’s Docklands"”. 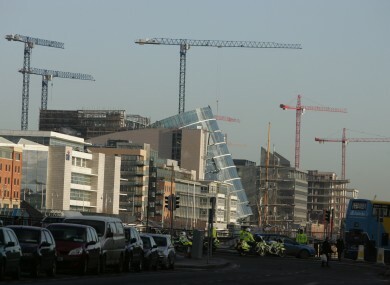 Feedback on “NAMA promises "the sight of cranes returning to Dublin’s Docklands"”.